We are experienced in providing dancers, musicians and callers for a wide variety of events, from informal ceilidhs to formal after dinner entertainment, from birthday parties to weddings and Burns suppers and all events in between. We can cater for small groups and large, for short fill-ins or for the whole event. Our programme can be flexible to provide exactly what you need to help make your event a success whether you want to be entertained, to participate or a mixture of both. 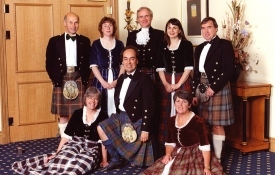 We can provide a team of Scottish Country Dancers and can call and lead ceilidh dancing. 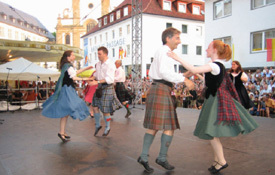 We also count some Highland Dancers and Step Dancers among our members who (when available) can diversify our programme. We have our own musicians who can play just for us or, by arrangement, for other aspects of your event. We have recently performed at a wedding in Duns Castle, a ceilidh in Fettes College for a European convention, and a demonstration at Princes Street Gardens.